I used three Bible verses about Jesus, and printed them around a large "J-E-S-U-S." This look is so versatile, you can use scriptures that reflect a holiday, like Thanksgiving or Christmas; a general theme, like family or hope in Christ; or any of your favorite verses. Vellum is see-through paper that comes in assorted colors. I used a pale aqua, but look for a color that will coordinate with your room or occasion. Measure the height and circumference of your glass votives. Add 1/4 inch to the length and that will be your printable area. Set up your layout in the computer and do a test print on copy paper. 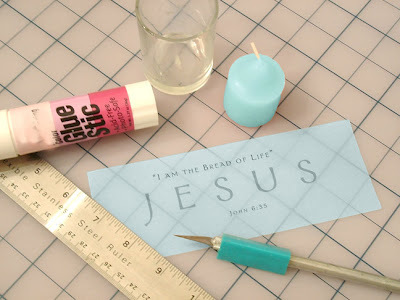 Cut and position it on your votive to be sure you've got it all right, then print on your vellum. Take a hair off the height dimension before cutting, so your paper sits just below the rim for safety. 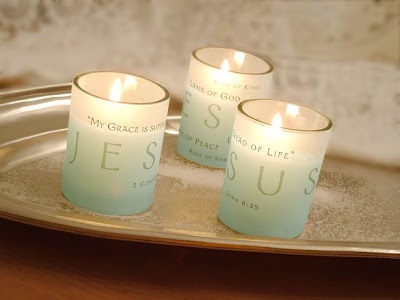 Glue the ends after wrapping around the votive. Note: You can do this same effect with your assorted stamps in place of a computer and printer. More Christmas ideas from around blogland. I love this idea! I regularly use vellum for punched and embossed, lacy-looking cards and bookmarks (it is a Brazilian craft that I love). I even have a huge roll of white vellum, but I have never thought of using them for something like this. Thanks for another great idea! Wow! This is a great idea - thanks!! love this project. great idea!! Hi, I am so happy to have come across your blog this morning, thanks to The Inspired Room blog. I LOVE this! Thank goodness you showed a tutorial, because I had NO idea how you did it! I'd better get busy if I want to use them for Thanksgiving dinner! Thanks for sharing with us! Great idea for gifts. This would be a good craft for my MOPS group too. Thanks! Thanks for dropping by my blog! I've really enjoyed my visit here. I'm bookmarking you! Oh my goodness what a lovely idea- I will be using that idea for sure- thanks for sharing! Wow - those are so cool :) It sounds easy enough for me to do. Thank you for the instruction. Great project...that is a really pretty idea! I loved this look. Thank you for sharing. Happy Thanksgiving.